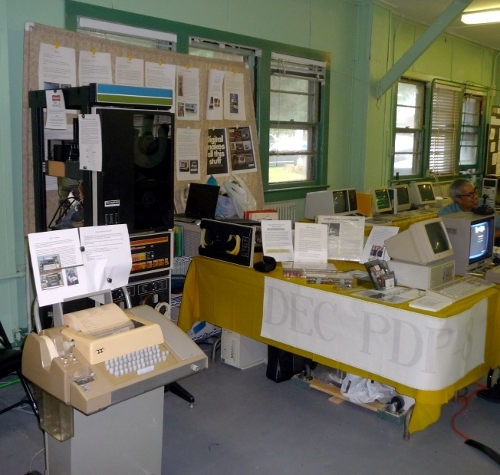 The retro computer hobbyist group MARCH hosted the Vintage Computer Festival East 2009 exhibit. I brought a PDP-8/E with TU10 and TU56 tape drives, PC04 paper tape reader/punch, teletype, and DECmate III for my exhibit. The PDP-8/E was the first Omnibus PDP-8. The DECmate III was the next to last of the PDP-8 line of computers. The PDP-8/E was running OS/8 and I was mainly demonstrating the TU10 1/2" vacuum column tape drive and the TU56 DECtape drive. I had some programs that would run for a while moving the tapes so people could see how they operated. The TU10 tapes were used for bulk data storage and interchange with other machines. The TU56 DECtape had a file system and was used like a really slow disk. I was running OS/8 from the DECtape. I also demonstrated loading programs from paper tape and allowed people to punch their name in block letters on the paper tape. The first day they didn't have enough power to run the computer. The second day I ran a long extension cord to an outlet with nothing else so I could run my exhibit. The power supply for the TU56 failed during the last few minutes of the show. Same failure as another power supply previously. I have replaced all of those capacitors in my supplies.